The New York Rangers, looking squarely into the eye of the storm schedule wise, shutout the rival New Jersey Devils by a score of 3-0. I personally thought that this was the game that could make or break the Rangers playoff hopes and the Blueshirts came through with a total team effort. The kids, Brandon Dubinsky, Dan Girardi, and Ryan Callahan supplied all the scoring for the Rangers. I was at MSG to witness this game and the Rangers did not disappoint! Skating, hitting, and Henrik Lundqvist outplaying Marty Brodeur... and last but not least, Sean Avery (Who once again got no respect from the referees) getting under the skin of what seemed like the whole New Jersey Devil team. After a scoreless 1st period, Brandon Dubinsky showed some skill and savvy as he out waited Brodeur to give the Rangers a 1-0 lead. Later on Dan Girardi blasted a beauty past Brodeur on a nice shove pass by Nik Antropov during a 4 on 4. That was Girardi's first goal in 53 games and as a former d-man, that has to feel real good for Girardi. The third and final goal of the game went to my personal team MVP choice, Ryan Callahan. Callahan's goal, like Girardi's, was fired high past Brodeur. All the scoring the Rangers needed came in the 2nd period as the Rangers sat back a little and the Devils tried to claw back in the game. I thought the Devils actually outplayed the Rangers for the duration of the game, but to no avail as Lundqvist was solid - making the saves look easy. The interesting part was in the 3rd, when different Devils tried their hand at getting Sean Avery. First, David Clarkson threw Avery down twice like a rag doll - with Avery showing restraint. Brave move by Clarkson, why don't you try that with Colton Orr? Anyways, Mike Rupp also took a shot at Avery at the end of the game and once again Avery showed great restraint. A couple of things come to my mind: give Sean Avery the credit he deserves with the NHL out to get him. He chose not to "dance" with Clarkson or Rupp. When you're winning, there's no need to partake in those types of activities. Also it sure looked like to me that the Devils were easily distracted by Avery's play - it looked very childish on the Devils part. Finally, I do have to question why Avery was on the ice with less than a minute to go in a 3-0 game? Just a thought. Overall, the Rangers passed a huge test. They got a big win in a critical game with playoff implications all around it. Fantastic effort, great night for Rangers fans and now it's off to Carolina. The Hurricanes have been the hottest team in the eastern conference, so it wont be easy. If the Rangers bring the same effort to Carolina as they showed against the Devils, they should be alright. On another note, the Garden was jumping last night with former Rangers. 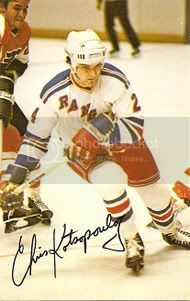 For me personally I was able to run into and chat with Tie Domi, Ron Duguay, Glen Anderson, Nick Fotiu, Gilles Villemure, Pete Stemkowski, Brad Park and one of my favorites from my rookie year - Steve Vickers. Also, before the game, my wife Lisa and I had the great pleasure of meeting Mark Rosenman. 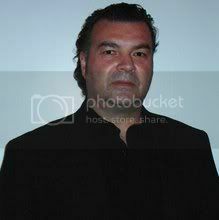 Mark is a huge Rangers fan and is the host of Sportstalk NY, an internet sports talk show that is building a nice fan base. Check it out on Wednesday's at 9 PM! Over and out! It seems like whenever the New York Rangers play the Pittsburgh Penguins at the Igloo, not only must they try to beat a very talented team - but they also have to beat the new age NHL and its referees. The score of the game was 4-3, in favor of the hometown Pens. Pittsburgh received all of the help that they needed from 2 of the worst officials I have ever witnessed refereeing an NHL game. Steve Kozari and Dave Jackson would be looking for a new job if I was in charge, but this is Gary Bettman's job and there is no way in Hell that he'd have the guts to review this game. Where do I start? First, poor old Sean Avery... what does he have to do to get some respect from the officiating? He gets crosschecked to the ice after a whistle as plain as day and no call? Come on, Gary. Get over it. You tried to blackball him from the league and now you're embarrassing the league with the "Avery Rules". It's just laughable. Next, how about Colton Orr's 5 minute major and game misconduct? Are you friggin' kidding? The 2 blind mice on the ice didn't make a call initially, but because Mark Eaton scraped himself off the ice showing a little blood the linesman makes the call. Mark Eaton was putting himself in a position to get drilled, and this is the key folks, Eaton puts himself in danger. So, the NHL wants to make up for a players stupidity. I don't get it, but there's more! Nik Antropov gets tripped up late in the 3rd period by Pascal Dupuis in the center of the ice, and again there's no call. Dupuis clearly sticks his leg out and down goes Antropov as a result. The Pittsburgh fans even thought there should of been a call, but of course there wasn't. That can't happen, especially when you have incompetent officials reffing a professional sport. Sorry, but this has become a continuing joke (especially for Rangers fans at Pittsburgh... anybody remember the high stick on Drury in Game 5 of last years playoffs?). You still think you're going to draw fans to watch crap like this? Good luck. Enough of my rant, the Rangers played their hearts out today and unfortunately there were 2 opponents that they had to overcome. I'm not going to talk about the hockey part of today's game because I'm still steamed at what I saw. Rangers players, keep your heads up. You deserved better! And as for the NHL? Get your heads out of your behinds. If not, you will lose more fans. Over and out! The New York Rangers lost a critical playoff point to the Atlanta Thrashers in a shoot-out by a score of 5-4. 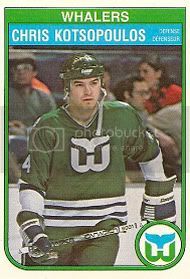 When Todd White scored the only goal in the 6 round shootout, he put an end to really what I would call a miserable night for the Rangers. The Rangers were extremely lucky to have built a 4-1 lead at one time late in the 2nd period. If not for a penalty filled game, the Thrashers outplayed the Blueshirts from beginning to end. I don't even want to go over who scored for who and all of that, it's a moot point. 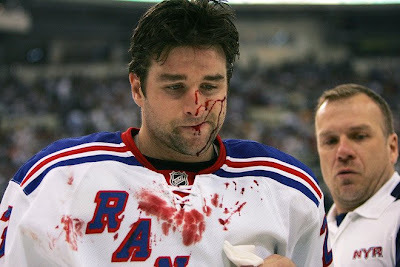 The collapse by the Rangers was staring them in the face from the time that they stepped on the ice. Atlanta was ready to go from the drop of the puck. I asked my son, Cody, which team looked like they were fighting for a playoff spot. It surely wasn't the Rangers. Even when somehow they managed to take the aforementioned 4-1 lead, I was thinking that you got to get to the 3rd period with the 3 goal lead and they'll be okay. But no, that's not what happened. They gave up a goal very late in the 2nd period to, I'll just call him a "difference maker", Ilya Kovalchuk. That's just not acceptable. I'm sure coach Tortorella was not pleased at all. Heading into the 3rd period you could feel that something was going to happen and not in a good way for the Rangers. The Rangers began to back up a little in this period. A fluke goal, and a pretty goal set up by "the difference maker" just about sealed the Rangers fate. I will say that the Rangers had a chance to bury Atlanta with yet another 5-3 PP (There were a few tonight) and they totally botched it up, big time (Where was Antropov in this situation?). Anyways, you know the rest of the story... not a good night for the Rangers. Sure, they got a point out of it... but it's not going to get any easier form here on out with Pittsburgh and New Jersey up ahead. One more thing... where was Zherdev in the shootout? Over and out! The New York Rangers got what they needed - a win. In a quick turn around from the dud against the Ottawa Senators, the Rangers captured a 2-1 victory over the Minnesota Wild and jumped up into 6th place in the Eastern Conference (tied with Pittsburgh in points). A goal by Nikolai Zherdev with less than 5 seconds to go in the 1st period gave the Rangers the start that they needed. Minnesota, quite frankly, is a tough and boring team to play against. Did I say boring? Oh, nevermind! With both teams fighting desperately for points in a push for the playoffs, Marian Gaborik (the guy who scored 5 goals in a game against the Blueshirts), scored on a nice deflection to even up the game at 1-1. That score didn't last too long though as Scott Gomez fired a one timer off of a Sean Avery pass that beat Niklas Backstrom - giving the Rangers a 2-1 lead. In a game like this, I figured it might be enough... it just had that feeling. Both teams sport an excellent penalty kill (Rangers # 1, Wild # 2) so PP's really wouldn't matter - and they certainly did not matter tonight. The Rangers went 0 for again, what a surprise! The total shots in the game favored the Rangers 30-19 as Henrik Lundqvist really only had a few scary moments late in the game. Other than that, it was rather "ho-hum" for the King in this contest. What was nice to see were the two spirited bouts. First, Sean Avery squared off with Cal Clutterbuck and then the old war horse Owen Nolan squared off with Colton Orr (not a good choice). Until Zherdev's late 1st period goal, the 2 fights kept me awake - thank God! Also, I thought the recently called up Michael Sauer played a real solid game for his first game as a Ranger. Good job! It was a big win for the Rangers tonight. This game was definitely a nice bounce back effort from the Ottawa loss a few nights ago. It's all in their hands now. 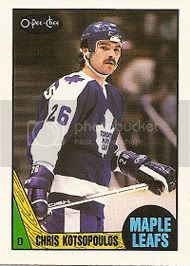 A former teammate of mine while with the Maple Leafs, Walt Poddubny, passed away this past Saturday. My deepest condolences go out to his family and friends. I didn't get to play very long with Walt, but what I can say is that he was a good person, a great teammate, and a solid player (definitely proved this during his time with the Rangers). It's a very sad time for us who played with and knew Walt. We're gonna miss you. The Ottawa Senators, one of the hottest teams in the NHL, came into MSG and promptly put the breaks to the New York Rangers playoff push. Alex Auld, who during his career owns the Rangers, gave up an early goal to Brandon Dubinsky. It was Dubinsky's first goal in 24 games... ouch! Give credit to Ryan Callahan who basically out-hustled the Ottawa D-Men and Auld to set up an empty netter for Dubinsky. Unfortunately, that was it for the Rangers on the night. The PP, which has been better lately, flunked the test tonight going 0-6. Not exactly what I would call being "clutch" when you needed it the most. After the Rangers first goal, Mike Comrie's backhander beat Henrik Lundqvist to tie it for the Sens early in the 2nd. Later on in the 3rd period, Ryan Shannon made a nice move on Wade Redden and fired a high wrist shot that glanced off the King's shoulder, but still found the far side. That goal gave Ottawa a 2-1 lead that had me thinking, "This one's over". The Rangers up til then just didn't have it. For what reason? That's anyone's guess. You can blame it on being tired or sluggish, but Ottawa played the night before as well... so that's a lame excuse. With the points being worth more than gold these days, it's unfortunate the Rangers couldn't meet the challenge. I don't want to down play the Senator's effort, but the Blueshirts energy and hustle just wasn't there. 1 goal and a lousy PP usually leads to a loss and that's exactly what the Rangers got. No time to think about it though as the Minnesota Wild will be in town on Tuesday at MSG. The Rangers must be ready for this as the Wild are in the midst of a playoff push themselves. This past Wednesday, Ron Greschner put on a nice event to benefit the Ron Greschner Foundation at the Aegean Cove restaurant in Queens, New York. The Restaurant is run by a good friend of ours, Georgio Neofytides. The people in attendance had a great time. The food was excellent and more importantly the money was donated towards finding a cure for autism. The other Ron, Ron Duguay, made his professional comeback on Saturday night for the Brooklyn Aces of the Eastern Pro Hockey League. I attended the game, as well as Ron Greschner, and it too was a great thing to see. Duguay, all 51 years of him, looked very good. He can still fly up and down the ice like he did when he played for the Rangers. I was very impressed overall. It was also for a good cause - the Garden of Dreams charity. The crowd was also very happy to see him on the skates once again. Well, that's it for now. Over and out! Markus Naslund, Nik Antropov, and Chris Drury went 3 for 3 in a 4-3 shootout win over the Montreal Canadiens. The Rangers dominated this game and it never should have got to a shootout, but on St. Patrick’s Day, Montreal got lucky more than once with the big one coming off of a Chris Drury mistake (Very un-veteran like). When Drury failed to dump the puck into the Canadiens zone, Andrei Markov wound up firing a puck past Henrik Lundqvist. It was a save that The King should have made - no ifs, ands, or buts. The Blueshirts basically outchanced Montreal (42-29 in favor of the Rangers) and looked like the more energetic team for most of the game. Nik Antropov started the Rangers off on the right foot by banging in a rebound off of a Chris Drury shot (How's that trade looking right now?). Alexei Kovalev answered for the Canadiens on a pretty pass by Andrei Markov with a perfect shot over Lundqvist's shoulder. 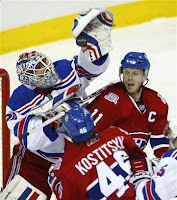 The other Nik, Nikolai Zherdev, fired a knuckle ball past a stunned Carey Price to give the Rangers a 2-1 lead. Once again, the Rangers aggression got Montreal back in the game when Marc Staal got caught up ice and Maxim Lapierre turned Dan Girardi inside out to tie the game at 2. After great work by Brandon Dubinsky behind the Canadiens net, Ryan Callahan's backhand gave the Rangers a seemingly comfortable 3-2 lead. Unfortunately, that's when the Drury gaff almost cost the Rangers the game and a late penalty kill on a silly tripping penalty by Scott Gomez with less than 2 minutes to go. I thought the luck of the Irish was against the Rangers, but they managed to kill the Penalty and get it to OT. In the end, Chris Drury made up in a way with the game winner on a nice 5-hole shot past Carey Price in the shootout. However, it never should have even come to that. The Canadiens got lucky tonight, the Rangers should have had the 2 points to Montreal's 0. Well, that's hockey. A couple of other things, how in the world do two referees miss the big elbow that Sean Avery took to his melon by Glen Metropolit? I think I can answer that... It's Sean Avery! That's how! Could you imagine if it was the other way around? The NHL brass, once again, looks like fools. But what else is new? The last thing that I want to discuss is that things never change in Montreal when it comes to their fans. I played at the old Forum and trust me, you were never going to get a break from the referees. The fans believe if you so much as breath on their beloved players, it's got to be a penalty. The new building? Same story. The referees will tell you different, but I believe that they get intimidated by the aura, history, and the fans of Montreal and that's that. Big win for the Rangers, but no time to relax... the playoff train ride continues at MSG on Saturday against the Sabres! In what I called a must win game for the New York Rangers, the Blueshirts faced off at 12:30 noon at MSG and proceeded to do just that with a nice 4-1 victory over the Philadelphia Flyers. The Rangers really took it to the Flyers after losing the opener of a home and home scenario 4-2 in Philly. Sean Avery led the Rangers with 2 PP goals and played with his usual reckless, "in your face" style that the Rangers have missed all season long. I, for one, am very happy that he's back. Avery's game has a little of everything - he can skate, hit, score, agitate, and most of all he has the opponent thinking about him constantly. I love it! Oh, and when Flyers coach John Stevens complained about Avery getting away with his stuff on the ice... all I can say is, "Wahhhh!" Has he looked at his own agitator (Scott Hartnell) lately? I'm just glad that Avery's back and I'm sure the Rangers fans are too! Getting back to the game, how about 3 PP goals! I mentioned Avery's 2, but Nik Antropov also popped one on the PP as well. I always say that you got to shoot the puck on the PP, don't get cute and Antropov didn't and he fired a beauty by Nittymaki. "Fast Freddy" Sjostrom finished the Flyers off with a nice wrap around goal to make the final score 4-1 in favor of the Blueshirts. King Henrik was steady and came up with the saves when needed. The Rangers D played well, although the Flyers took 10 penalties to the Rangers 6 which definitely helped. It was a big win, as I mentioned. With the standings being as tight as they are, all of the games left are like the playoffs for the Rangers. I do have to get something off my chest though. Why is it the NHL thinks that it is okay to change the rules during the season? When Mike Richards cleaned Nikolai Zherdev's clock with a hard bodycheck (Which was clean), Dan Girardi jumped in to fight Richards (Which I don't like, keep your head up and you won't get hammered). He received a 2 minute instigator penalty, 5 for fighting, and a 10 minute misconduct? Are you kidding me? With the GM's meeting just ending and all the talk about the fighting issue, you start giving 10 minute misconducts now? What a joke Gary Bettman and his cronies have become. You did it last year too with the "Avery Rules". Now this? Give me a break. Any how, it's off to Montreal on Tuesday - where they have not faired well lately. Let's hope for a change and a Rangers win. Over and out! I am sad to say that my other favorite team, the Quinnipiac Bobcats, were eliminated by the St. Lawrence Saints in the ECAC hockey quarter-finals. Friday they dropped a 5-3 decision and then lost the next night by the same score in a best of 3 series. It was a tough year for the Bobcats. At times they looked like they could beat the world, at other times... well... to put it lightly, they were not very good. Congratulations goes out to St. Lawrence and for the Bobcats, there's always next year! The New York Rangers, knowing quite well that their playoff fate is in their own hands, came up with a huge effort against the Nashville Predators with a 4-2 victory. The Rangers came out flying in the first 5 minutes and it showed when Sean Avery banged in a rebound to give the Rangers an early 1-0 lead. However, from that time on until the end of the 1st period, the Rangers took all their own momentum away by taking 3-straight penalties (Boy were some of those dumb and I'm being kind). Nashville, who has a poor PP themselves, was able to capitalize on Markus Naslund's interference penalty. Shea Webber fired an off-wing wrist shot past Henrik Lundqvist - who got a piece of the shot, but not enough (He's gotta make that save, no excuses). From there, J.P. Dumont got a gift goal off of Dan Girardi's skate which gave the Predators a 2-1 lead at the end of the 1st period. 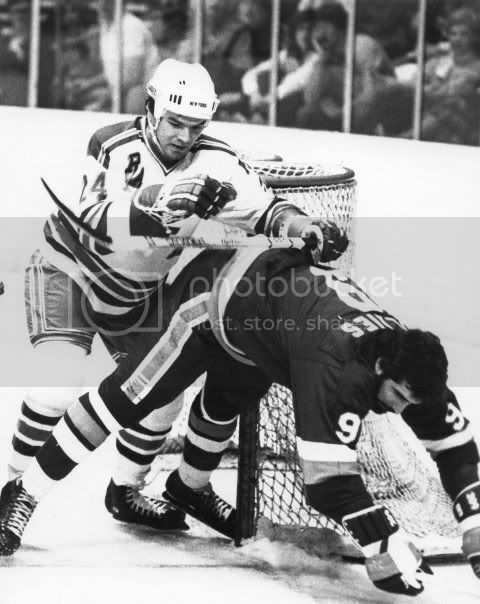 In between periods, I can only tell you from my experience as a player is what went on in the dressing room - to put it frankly, was a good old fashioned tongue lashing. There was one player in particular that got the worst of it - Nikolai Zherdev. Zherdev has all the talent in the world, but at times he reminds me of Alexei Kovalev with the "I don't care" type of play. I'm pretty sure Zherdev's benching has to do with effort, not skill. Anyway, the result was the lines changed constantly and the Rangers played one of their best periods in months. Goals by Scott Gomez and Marc Staal gave the Rangers a 3-2 lead that they would not give up. You gotta give Coach Tortorella credit for making the decision to bench Zherdev and play the players who were going well. Zherdev may not have stepped on the ice, but there were a few other players who the Rangers expect more of and as a result found themselves getting less ice time as the game wore on. I think Coach Tortorella knows there's not many games left, so if he has to hurt a few feelings then so be it. The playoffs are the goal and the Rangers received a ton of help around the league tonight. Now it's on to Philly for a home and home... should be very entertaining to say the least. Over and out! Listen to the Bobcats on the radio this weekend as they take on St. Lawrence in the best of 3 series (unfortunately I will not be able to do the color). After spending the weekend doing radio work for the Quinnipiac Bobcats, I thought I would settle in my "Archie Bunker Chair" and enjoy the New York Rangers vs. the Carolina Hurricanes. I was hoping for a good night for the Rangers and getting to sit back and enjoy the game. Ugh! Is all I can say. Boy, was that a clunker of a game for the Rangers tonight. No offense what so ever. There was not one player that I can think of, other than Valiquette, that you can honestly say showed up tonight. Cam Ward turned back all 27 shots the Rangers fired on him, but really how many were serious scoring shots? 2, maybe 3? And even that's a reach. The Canes struck first when defenseman Joe Corvo beat Brandon Dubinsky and Nikolai Zherdev up the ice and poked in a puck past Valiquette (who made a great initial save). Sorry, you can get away with that early in the season - but not now. Every game has playoff implications and really there's no time left in the season to make it up. After that, Carolina connected on it's 4th PP attempt on a blast by Rod Brind'Amour. That goal, for all intents and purposes, sealed the deal as the Rangers could not find any sustained offense for Cam Ward to worry about! Other observations in the game for me was Sean Avery is trying just a little too hard to impress and it cost the Blueshirts on PP and negated another. I am a big fan of Avery's, but tonight was not one of his best efforts (He had lots of company). Oh well, as one of my followers of my blog (Mr. Hockey) once wrote, "No score goalie, no win gamie". How true is that? Now the Rangers head off to Nashville. The team will need a huge effort to win that game, the Predators are no slouch! Over and out! The Quinnipiac Bobcats played 3 sudden death OT games over the weekend against the Colgate Raiders. Brandon Wong finished Colgate off with his 2nd OT winner in 3 nights as the Bobcats advanced to the 2nd round of the ECAC playoffs. In the next round, the Bobcats will be facing St. Lawrence University. It was a great series to watch this past weekend. Colgate and Quinnipiac put on quite an exciting 3 nights of hockey. Goaltender Bud Fisher was fantastic in the final game and that's just what you need in the playoffs - solid goaltending. It should be a good match-up between Quinnipiac and St. Lawrence as the teams both won at each other's home rink this regular season. Unfortunately, I won't be available to work the radio broadcast, but I will be listening! Go Bobcats! 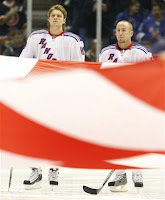 In a hard fought struggle, the New York Rangers took a 4-2 victory over a "Who's who" version of the New York Islanders. The Rangers stars - or leaders - whatever you want to call them, stepped up and led the way for the Blueshirts. Zherdev, Drury, Gomez, and Naslund all struck gold for the Rangers tonight. Boy, when was the last time these four guys scored in the same game? It was nice to see! King Henrik was his usual self - making some tough saves at the right time to give his club a boost when needed (Although he cheated a little on the goals that he allowed). I thought the Islanders played a very energetic game considering all of the new faces in the lineup after the trade deadline. The Islanders really outplayed the Rangers for the most part in this game. On the Rangers side, Avery was his normal self. He got into the minds of the opposition and really just tried to get a feel for the NHL game again that was temporarily taken away from him. He gets a passing mark from me in his first game back. Nik Antropov showed what they got him for: he has good hands and is a hard body to move in front of the net. Antropov's backhand pass to Drury on the PP goal was a beauty (Not many try that kind of pass). One thing about Antropov that Rangers fans better not expect is a banger type of player. Sorry, he's big, but that's just not his style. He is, however, a big asset to the team. As for Derek Morris, I like this pickup and he will be a steady performer on the D. His game gives you a little of everything - hitting, good skater, can move the puck, and will play tough when needed. There were some bad points to this game tonight though. There was one thing in particular that bothered me the most with all the high-tempo attack and pressure style coach Tortorella is trying to implement. This type of play does not mean that you can play reckless and they were too reckless defensively for my liking tonight. Too many odd man rushes and late skaters not being picked up. Against the Islanders, you can get away with this, against some other teams... well, I think you get my point. I don't want to be picky though. The leaders of this team came through and I hope that it's a sign of good things to come for the Rangers. The "Big Bad" Bruins await the Rangers on Sunday now. I will be away again this weekend as the ECAC hockey playoffs begin. The Quinnipiac Bobcats host a best-of-3 playoff series at the TD Banknorth Center in Hamden, Connecticut. The Bobcats will take on the Colgate Raiders. Over and out! While I was away at work this weekend, the New York Rangers took it out on the Colorado Avalanche by a score of 6-1. No, that is not a misprint. 6 goals by the Rangers is a season high and it helped contribute to a much needed win for the Blueshirts. Not only was it important towards the playoff push, but it was probably more important for the psyche of the players. It proves to them that they can score and it helps build the confidence of the team overall. It was, from what I've been told, a complete game. Goals, hits, great defense, and throw in a few fights (Orr Vs Stewart, Mara Vs Tucker)... hockey at its best. I obviously did not get to view the game, but by all accounts from my son and true diehard Rangers fan friends, it was by far the best effort in quite some time. I hope that it continues because this playoff race is gonna be just wild. With the trade deadline approaching, it will be interesting to see what moves that Glen Sather can make to give the team a little boost. They already received one with Tortorella's hiring and now the clock ticks... will they or will they not make the moves? I'm betting yes, but you never know! As for my other favorite hockey team... the Quinnipiac Bobcats who lost a tough game at Harvard, 2-1, managed to rebound with a 4-1 at Dartmouth. The win was key as it clinched a home ice advantage for the first round of the ECAC playoffs next week against Colgate. Congratulations goes out to the Bobcats players and coaching staff! It's been a long and tough regular season featuring many ups an downs. But, as we all know, the playoffs are a "new" season all together. You get to wipe the slate clean and have a fresh start. I'm looking forward to next week. Over and out!